Coffee lovers in the Liguanea coffee zone of Kingston need to know the best time to get a cup of coffee. The three most popular cafes in Liguanea actually have different high and low periods and its not necessarily what you think. The high periods are 11am at Cafe Blue, 11 at Cannonball and noon at Starbucks, that’s according to Google spy information. It means that if you like people watching go to Cafe Blue at 11 and make your rounds to other cafes by noon. Conversely, the best time to run in for a coffee without long lines would be 6am Starbucks, 8 am at Cannonball and 7pm at Cafe Blue. So for all those Airbnb visitors with nothing to do mid day or players with the perfect pick-up lines avoid the mornings. Ok, So there the coffee festival planned for the first weekend in March. Interested , well it depends on whether coffee is your love or your money-muse. The first day, March 1 is business Development workshops For Farmers. Don’t let that deter you. It’s really the perfect day for overseas and locals roasters and traders who want to meet with local farmers and processors. After all we all want the access to the holy grail–Green beans. You can barter with the farmers or play hard ball with the licensed processors. Last year like this year, the farmer workshops happened in the hills of the blue mountains. So those who need the best beans can take a visit. I doubt there’s an entrance fee like the festival itself on Saturday and Sunday at J$1,500 or about $12 USD. Industry players are again contemplating sending green or unroasted beans to China in an effort to offset reduced demand in Japan, the largest buying market for Jamaica Blue Mountain (JBM) coffee. The source indicates that its a real possibility despite concerns about the Chinese market and the potential for unauthorised blending of beans. “We have to try something,” added the source. In 2011, the Coffee Industry of Jamaica (CIB) sent its first shipment of green beans to China. The CIB sent representatives to live in the country in order to streamline the supply chain. The deal signed with Zhejiang Dunn’s River Import and Export Company Limited, would handle the commercial transactions of the Hangzhou Coffee and Western Foods. The deal was met with ambivalence from some Japanese buyers who questioned the price at which the beans were sold to China. The deal with the major importer wasn’t continued after the initial two year attempt. But with the softening of the Japanese market the search for new markets are inevitable.As the industry can no longer avoid the world’s second largest economy. Good coffee costs up to US$8 a cup in Eastern Europe. Among the most expensive globally. 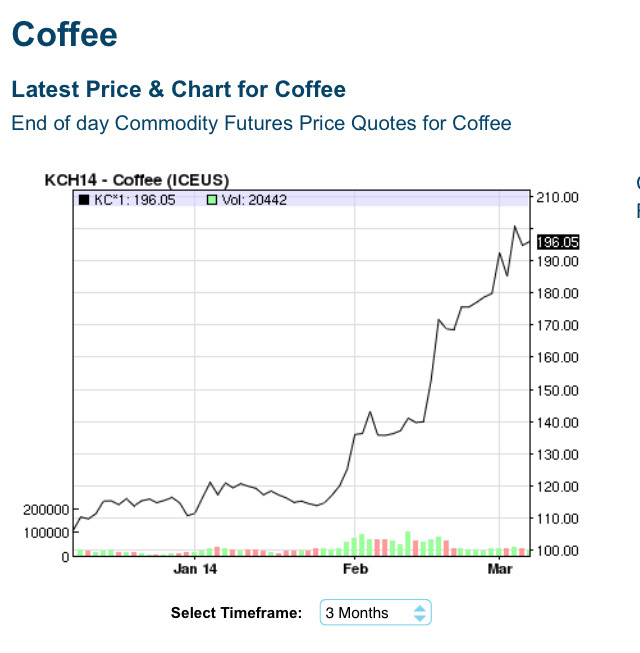 So the fact that Russians and Ukrainians flock for bargain luxury coffee deals online is logical. Nothing like the chocolatey aroma and lemon hints aroma of a balanced Blue Mountain cup to warm the bitter winter. Even better when a cup effectively costs US$3 because it eliminated the middle-man. But what becomes illogical is enjoying coffee in conflict. Putin’s intervention influenced a spike in global oil prices–the most traded commodity. It increased some 10 per cent February to March to US$104 a barrel (amid fears oil rich Russia would plug gas and oil pipelines running through Ukraine). However the second most traded commodity–coffee also saw a rise during the same period (February to March) albeit a much higher spike up nearly 2/3rds from 120 to 196. Its blamed on drought in Brazil among the largest coffee producing nations. It however is happening amid the heightened Ukraine conflict. It will no doubt result in a more expensive cup of coffee for this region. Despite this impact–the true tragedy is death and conflict and not the cost of a caffeine fix. The coffee nation of Jamaica will hike imports amidst slashing its local production by nearly half to 20-year lows. Consequently, Government aims to formulate a coffee importation policy. “Its a troubling situation,” said John Minott, president of the Jamaica Coffee Growers Association, (JCGA) at the Coffee Industry Stakeholders Retreat on the weekend at the Jamaica Conference Centre in Kingston. Rust disease, hurricanes and the abandonment of farms has reduced available trees and therefore production since the onset of the Western financial crisis in 2008. Minott argued for an importation window during which replanting should occur. 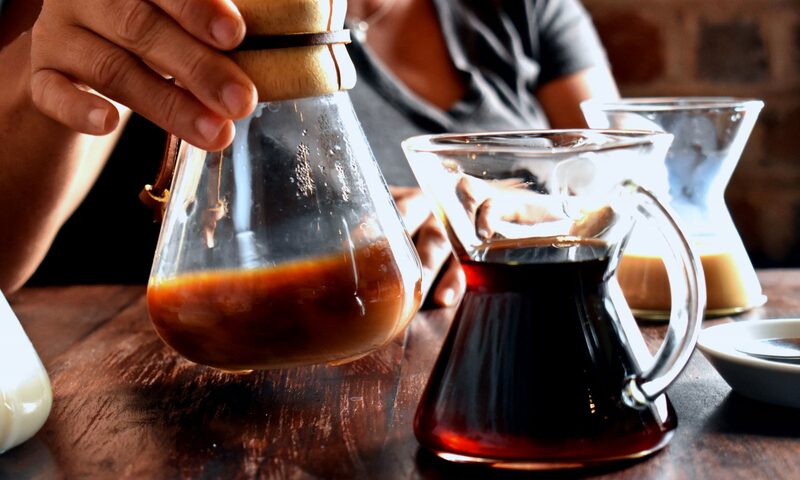 Coffee imports hit some US$1.78 million in 2012 up some 23 per cent since 2008, according to data from the International Trade Centre (ITC) a joint agency of the World Trade Organisation and the United Nations. Contrastingly, exports dipped by double-digit levels to some US$17.3 million in 2012, according to the latest Bank of Jamaica data. But the crop traditionally earned about US$25 million annually up to the onset of the financial crisis.